There has hardly been a day in the 20+ years of practicing ophthalmology in Philadelphia where Dr. Kanoff wasn’t looking forward to seeing his patients. Over the years, while practicing as an ophthalmologist in the Philadelphia area, Dr. Kanoff has developed a special interest in helping patients with medical eye conditions such as glaucoma, macular degeneration and diabetic retinopathy. “If you’ve been diagnosed with a serious eye condition, you’ll want to seek out the most advanced treatment with a very experienced ophthalmologist,” stated Dr. Kanoff. “It’s important for me to provide the highest quality, total vision care to my patients. I use state-of-the-art equipment and diagnostic tools, in the most caring and compassionate manner possible, always striving for each patient to have a completely positive experience.” Dr. Kanoff also works with cataract patients delivering pre and post-surgical care. Regardless of the nature of your required eye care, from routine visits to the treatment of serious eye conditions, Dr. Kanoff and Ophthalmology Physicians & Surgeons provide complete medical ophthalmology services to the Philadelphia, PA community. Dr. Kanoff is a board-certified Ophthalmologist and a member of the American Board of Ophthalmology and when not seeing patients at Ophthalmology Physicians & Surgeons, you’ll find him at the prestigious Wills Eye Hospital, where he is a clinical instructor. Experience. Knowledge. Trust. Those are the attributes that Dr. Kanoff brings to his patients’ care. 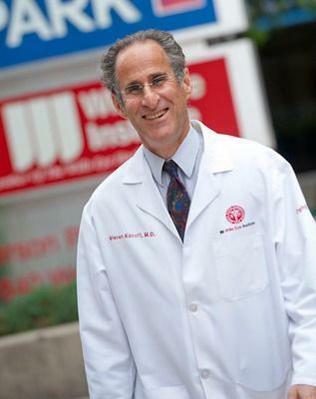 MORE ABOUT STEVEN KANOFF, M.D. Dr. Kanoff is a board certified ophthalmologist. He has been in the practice of comprehensive ophthalmology since 1989 in the Lehigh Valley. Dr. Kanoff completed his residency at the University of Colorado Health Sciences Center after graduating medical school at Temple University where he was a member of the Alpha Omega Alpha Medical Society. Currently, Dr. Kanoff sees patients in the Bethlehem office. He also is an attending ophthalmologist at Wills Eye Hospital where he supervises ophthalmology residents in patient care. At Ophthalmology Physicians & Surgeons, we have 8 Bucks/Montgomery/Lehigh-area Philadelphia eye care offices and eleven highly trained eye doctors focusing on various aspects of eye health, and we are equipped to meet the needs of your entire family. We proudly partner with the Wills Eye Surgical Centers, the largest eye hospital in the U.S., and our doctors have been recognized for their leadership and outstanding patient care. We are also committed to incorporating the latest technology for your optimal health and safety. Whether you need a simple vision test, or advanced eye surgery, we can provide you and your loved ones with the exceptional results you deserve. Call our office today to book your appointment.